Bottom half cold, top half hot! Thought I would do a quick personal post as I haven’t done one for a little while. Due to the hot weather we have had recently it has made a little problem of mine all the more uncomfortable. My legs and feet are always cold, as I live from bed they are normally under the covers, but my top half is nearly always hot! What’s that all about? Its extremely bizarre and a bit of a nightmare to manage. I am not joking when I say I can be dripping with sweat and have stone cold legs. I am guessing circulation may be one of the problems or perhaps some of the nerves problems down by L5/S1? Who knows, it could even be down to morphine dependency and the damage to the pituitary as that messes with the bodies thermostat at the best of times. When I am out of bed I nearly always wear long johns. A good friend came round for a takeaway and a chat the other day, I took my morphine and had a nice time for a couple of hours. But I hadn’t put my long johns on, that night was terrible, I was up all night in pain. I couldn’t sleep because the pain was so bad I couldn’t actually keep still. Around 4am I took a hefty narcotic cocktail which finally put me out ending the misery. It had been a week since I last had a day out of bed but I was still “recovering” from that, perhaps I did it too soon or should have put my long johns on. To be honest its quickly becoming my number 1 mobility concern and need to think of a better solution, if I wear long johns to much I can get UTI’s which are not nice either. Oh and I forgot to mention on my first edition that it was one of the hottest days this year too when these happened! Osgood-Schlatter’s Disease as a teenager. Not much hope for those knees then! It just reminded me of the pain and suffering a simple home visit can bring and the person visiting has no clue of the result, although I wouldn’t really want them to know and wouldn’t change a visit, maybe just my choice of Long Johns! I would like to hear from anyone with similar problems, especially those in their 20’s or on the same medication. Night time nasal congestion can affect more than just your sleep, it can influence how you feel all day long especially with Fibromyalgia as patients often have sleeping problems. However they can help you if you are suffering from stuffiness or nasal congestion caused by colds or allergies as well. Breathe Right is a drug-free product that works instantly and can help you breathe better, sleep better and feel better. Breathe Right nasal strips are applied to the outside of your nose, which simply opens nasal passages so you can breathe better. 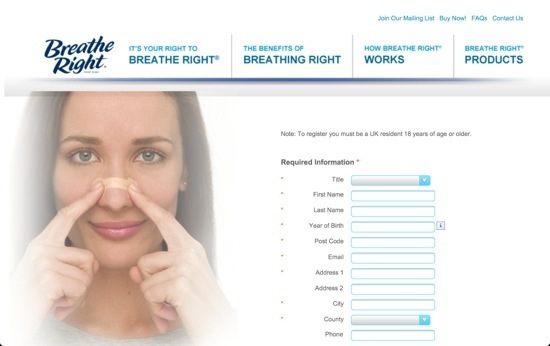 Each drug-free Breathe Right nasal strip consists of flexible, “spring-like” bands. Placed correctly across the nose, the bands gently lift the sides of the nose to provide relief. 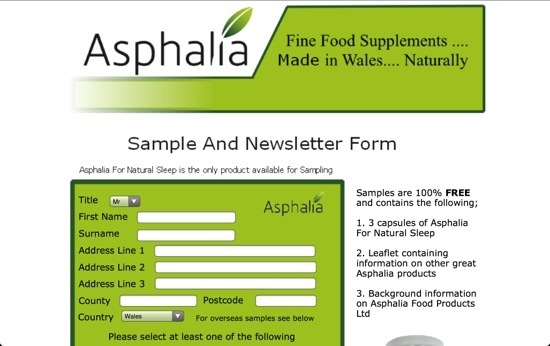 Asphalia (Asphalia Food Products Ltd) are offering free samples of natural sleeping tablets through their website here. This website has no affiliation with Asphalia and we get no money or advantage for referring customers to their website for samples. Quite simply I noticed this deal being spoken about in consumer forums and as Fibromyalgia patients often suffer from sleeping problems I decided to post about to allow readers to get something for nothing as it doesn’t happen often enough. Now the word is out the deal probably won’t last very long as it will soon, probably, be overwhelmed and the offer withdrawn so if you want to take part the don’t hang around. Obviously speak to your doctor about these tablets before taking them as you should do with any medication, even over the counter or herbal/natural remedies. Drug interactions can be lethal so don’t miss this very important step and be very careful when buying things over the Internet, as we can not verify this company, its website or its products, so it is up to you to do your research. It is worthwhile mentioning that for such deals your really not getting it for free but merely agreeing to exchange your personal details for a sample of a product. They can then use your details for marketing unless you tell them not to. However your data remains your data so you can request at any time for them to delete your data and they are lawfully bound to do so because of the Data Protection Act. Also remember you might not know by then if the company have sold your data on, so before you sign up choose if this is something worthwhile for you, if it is then great. This product is not suitable for asthmatics. I would be grateful for feedback on these, do they work for you? Comment on this post bellow. I have wanted to write and article on Insomnia and related sleep problems now for some time. This is because I would say that Insomnia is by biggest problem and it can happen to anyone not just those with Fibromyalgia, CFS & M.E. It is also the most common medical complaint I hear from my friends and because of my problems I have been looking at Insomnia as a subject for many years. The reason Insomnia is my biggest problem is rather simple: It magnifies any medical complaint and makes it worse. Problems with my sleep cause me to become very tired, experience more pain, experience more “Fibro Fog” or “Brain Fog” and over the years sleep has had a dramatic effect on my memory. Insomnia is capable of completely ruining your life as it is so hard to control and can stop or seriously hamper you in performing any task you choose. There are various myths around about Insomnia, I have been amazed by how many people think Insomnia is a condition that makes people require less sleep than normal. The truth is almost any problem in your control over sleep could be classed as Insomnia at first. On some occasions when Insomnia is investigated other medical conditions are found such as Sleep Apnoea. For the rest of us there are plenty of things to try but almost nothing to turn to that can help. First and foremost learn more about Insomnia on basic heath websites such as the NHS website, patient.co.uk etc etc to make sure what you think is Insomnia is accurate. Secondly open yourself up to the idea that Insomnia can be caused by many things and can be helped by even more. You are going to have to start looking at the reasons “why” you have sleep problems and start trying various things out. Number one on your list should be “good sleep hygiene.” This is a fairly new term explaining how you can change your behaviour, surroundings and psychology in order to give you a better chance of having a good nights sleep. People with Insomnia can often associate their bedrooms with things that are not related to sleep. Your bedroom should be a place for sleep and not many other activities. You should not be using your bedroom or at least your bed as a multi purpose place for eating, playing games, watching television, reading, writing or working. You need to associate your bed with sleep and relaxation. If for some reason your bedroom is to noisy, too hot, too cold, too light or too uncomfortable look into what you can do to solve these problems. Establish a good routine and avoid using stimulants (including caffeine and sugar), exercising, watching action packed television or playing computer games before you go try and go to sleep. Studies have shown that engaging yourself in a gripping television program or movie, playing a fast paced computer game, or emotionally identifying with characters in books can cause your body to respond as if you were the character in the same situation and it can increase your heart rate, release adrenaline and speed up your brain activity all things which are the opposite of relaxing yourself into refreshing sleep. After you look and “good sleep hygiene” you should then go talk things through with your GP if you are not finding any improvement. Now advice from your GP can vary a lot, some GP’s will refer you to an expert, look into the reasons behind your sleep problem and help you with them but some will send you off with a prescription for a tranquilliser. It goes without saying that you should try most things BEFORE you start to try Drug related assistance for your sleep. All medications have side effects and are always a compromise, if you can steer clear of medications at the start your body will thank you for it. I am by no means saying that you should not take medications at all, I am just saying do not make it one of your first steps. It is also worth pointing out that medications that can help you sleep could effect your abilities to drive, operate machinery and alter your functions when awake and a lot of sleep related medicines can be addictive as well. It is also worth mentioning you should go see your GP straight away if your sleep problems are related to pain or difficulties in breathing. Complimentary medicine can also pay its part in helping you to sleep depending on what is behind your sleeping problems. It is worth exploring natural remedies or therapies but always run this by your doctor first and discuss taking natural remedies alongside any medication as dangerous drug interactions are not limited to medicines alone and some of these interactions can be very dangerous and people giving you natural and complimentary medicine are likely to be far less qualified than your GP. This is a difficult one and I would go as far as saying sleep problems can actually cause Fibromyalgia and if you have been diagnosed with it your probably going to know already what sleep problems can do to you. When you have Fibromyalgia it is very difficult to judge how much sleep your body needs, sometimes it seems to cope fine with little sleep and terribly with long sleep and there is no way to find out what your body needs. Depending on the severity of your symptoms, like me you may live the majority of your time in bed. Due to this you will have to break some of the rules about good sleep hygiene and use your bed not just for sleeping but for living in. If this is the case a day bed may be an investment. Another investment that I made a few years ago was a Tempur mattress, they are very expensive but I knew if it could help me there was a greater chance of me being able to do some activities that could bring money into the family. With Fibromyalgia your more likely to feel the lumps and bumps in feathers and springs used in normal mattresses and a memory foam mattress can really help. If you sleep in the same bed as your partner it does a good job of keeping your movements to your side of the bed so not to disturb their sleep, with this in mind I went for a Superking Size bed and is worth considering the option if you have the space. One thing I will say about memory foam is that it can keep you warmer than a regular mattress so if you have problems overheating in the night memory foam might not be for you. Every cloud has a silver lining and Fibromyalgia is certainly a cloud of the big dark type. However one silver lining is this: Some medications used to treat Fibromyalgia pain can also be used to treat sleep problems so you could take one pill to help both. The over active mind is probably the most common cause of Insomnia that people have used when discussing their sleep problems with me. Also it is a problem for me. Firstly I would urge you to look at sleep hygiene again as you may be stimulating your mind too much before or during the time you are trying to sleep however there are exceptions. Things like television, books or games before bed have been known to work for the over active mind as they take your mind of your daily stress and transport it to a far less anxious place before bed. Don’t be afraid to try things that are not considered good sleep hygiene as you will soon know if they work and if they don’t you can cut them back out again just as easy. The notepad and paper idea is a good one, the concept is that if you have things going through your mind all the time you may be getting anxious about remembering them all in the morning, a simple pen and paper by the bed allows you to make a note of the idea in seconds knowing its safe and this in turn reduces your levels of anxiety and stress. One last thing is explore the mind based therapies, things like counselling and CBT can be accessed through the health service (if you don’t mind waiting) and could really help you if its your mind stopping you to sleep so make sure you look into these. ……… is lie in bed, frustrated and let Insomnia ruin your life. Insomnia is so difficult to treat and there are so many causes for it, but it is better to be patient and to try something new than to lie in bed winding yourself up. Often it could be better to get up, read a book, have a walk round the house and go back to bed for a fresh try! Searching around soon turns up many books on the subject of Insomnia, most seem to promise to solve your problems even though I’m rather sceptical. I have complied a collection of e-books for the Kindle under £2 for anyone wanting to read more about the subject or for those who are trying everything everything to solve their sleep problems. It is worth mentioning that now and again these books do come up for FREE and Amazon Prime members can “borrow” these books from Amazon at no cost. I have not read any of these books however if you do I would love to have people get in touch with a review of the book they have read, if this happens I will put each book with a review into the products section of this website and I am more than happy to credit you in your review.